The 1913 wedding of the Kaiser’s daughter, Princess Viktoria Louise of Prussia, to Ernst of Hanover was the last hurrah of aristocratic pre-war spectacle. It was the last time the Kaiser, the Tsar and George V, all cousins, ever saw one another. The Tsar and the British King wore Prussian uniforms while the Kaiser wore a British Admiral’s uniform. It was the British Queen Mary, however, who stole the show. In addition to her ornate gown made of cloth of gold, she wore the George IV State Diadem with nine diamond necklaces and suspended from the lowest, a pendant made of the famous diamonds: Cullinans III and IV. The largest diamond in the world was discovered in 1905 when Mr. Frederick Wells, the superintendent of the Premier Mine in South Africa, saw an object something reflecting the last slanting rays of the setting sun only eighteen feet beneath the surface. Named after the owner who happened to be visiting the mine that day, Sir Thomas Cullinan, the diamond weighed 3106 carats, which is roughly 1£ pounds of pure diamond. The Transvaal government purchased the diamond and presented as a birthday present to King Edward VII in 1907. The rough diamond was studied for months before Mr. Asscher, a famous diamond cutter in Amsterdam, finally struck the blow to split it apart. The blade broke, but the second strike was successful, although Asscher fell to the floor in a faint. The nine largest stones are either personal possessions of the British Royal Family or included in the British Crown Jewels. Cullinan I, known as the Star of Africa, weighs an astonishing 530.20 carats and is mounted atop the Sovereign’s Royal Sceptre. It is on display in the tower of London, as it the next largest stone, Cullinan II at 317.40 carats and currently mounted on the front band of the Imperial State Crown. Cullinan III is a pear-shaped diamond weighing 94.40 carats and is usually worn with its sister Cullinan IV, a 63.60-carat cushion shape. It is these diamonds that Queen Mary brought to Berlin to wear for the 1913 wedding of the Kaiser’s daughter. These were probably Queen Mary’s favourite diamonds, perhaps because they were given to Queen Mary in 1910 by the South African government, along with Cullinans V and VII through IX plus other leftover chippings. These diamonds were originally given to the Asscher company as payment for cutting the Cullinan Diamond but the new South African government bought them and gave them to Mary as a gift. In 1958, Queen Elizabeth II visited Asscher’s, the site of the initial Cullinan cutting, and wore Cullinans III and IV as a brooch. This brooch is the most valuable item of jewellery currently in the Queen’s possession. She removed it for Louis Asscher to inspect, who had attended the original cutting by his brother in 1908, and was heard to refer to the diamonds as “Granny’s Chips,” a nickname that has endured. Queen Mary loved her Cullinans and wore them in a variety of ways. Perhaps their most spectacular outing was for the state opening of Parliament on the 6th of February, 1911. 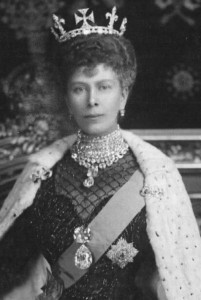 On that ocassion, Queen Mary wore Cullinan I and II as a brooch as well as Cullinan III and IV suspended from her diamond necklaces.